Overcharging your solar battery is a serious concern for those with an off-grid solar power system. If you’re off-grid and ruin any of your batteries, you’re going to have less energy stored, which means less energy available for use. At West Coast Solar, we fully support the use of renewable energy, whether as a grid tie-in or as an off-grid project. We encourage you, however, to take the necessary precautions to ensure your Sacramento residence is powered adequately. In this post, we’re going to share our view on whether or not you need a solar charge controller for your off-grid solar power system. It’s best to consult an expert on this topic before making any major purchases. Whether you’ve already been doing research or you gleaned a general definition from above, a solar charge controller allows you to control how much energy is being stored in specific batteries in your solar system. This means the controller moderates the energy stored to not exceed the voltage capacity of the battery. Why is important? If too much energy is “pushed” into the battery, it could ruin it, which means an unnecessary expense to replace said battery. Those who should use a solar charge controller typically use off-grid home solar systems or smaller solar systems for boats, RVs, or campers. If your solar system is tied into the grid, you will most likely not need a solar charge controller. A tied-in system is installed to deliver excess energy to the grid once the system batteries are full. For those planning to go off-grid with their energy use for home, RV, camper, or boat, there are two main types of solar charge controllers you’ll want to consider purchasing. PWM charge controllers are the most common type of controllers available to consumers. The PWM controller is much simpler than its MPPT counterpart, and it’s less expensive. As a battery nears its charge capacity, a PWM controller will slowly reduce the charge being sent to the battery. Once the battery is at capacity, the PWM controller “trickles” energy into the battery to keep it topped off as power is used. It’s important to make sure your solar system and your batteries have close-to-matching voltage when it comes to production and capacity. If they don’t, a PWM controller may not be the best option. In most cases, PWM charge controllers are great for small-to-medium solar systems. An MPPT charge controller is an advanced version of a PWM controller, and it is more expensive. Nonetheless, the increase in price does come with an increase in functionality and features otherwise not found with PWM controllers. An MPPT controller is able to pair non-matching voltages between solar systems and batteries, which means it can adjust the energy flow to ensure your battery does not overcharge and your excess energy is managed appropriately. At West Coast Solar, we want you and everyone else to experience the benefits of renewable energy. 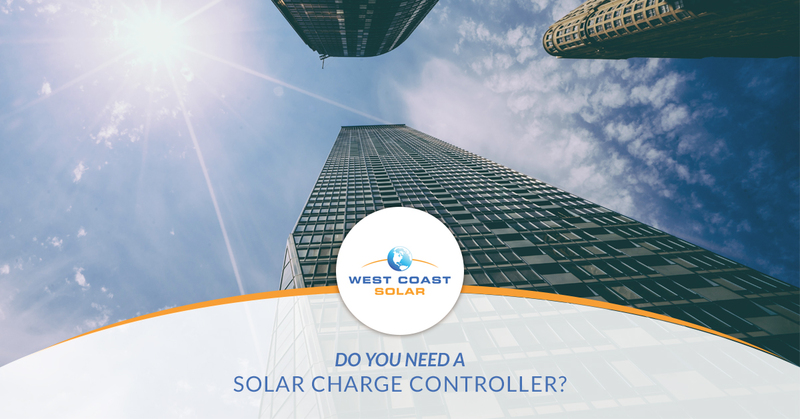 If you’re in the process of designing or installing your own solar system, seriously consider the type of solar charge controller you might need. In most cases, smaller solar systems can get by with a PWM charge controller, due to the ease of matching voltage between system and batteries. When you get into the medium to large sized systems like the one you would use for your home, you’re going to want to go with an MPPT controller. Finally, if you’re home’s power is already connected to the grid, you won’t need a charge controller. Any excess power will simply be fed to the grid, and your batteries will remain intact. The primary reason most homeowners make the switch to solar power is to save money, and we don’t blame them. As energy prices continue to skyrocket, homeowners, business owners, and everyone in between are looking for alternative energy sources that don’t break the bank. At West Coast Solar, we keep solar simple so you can benefit from it without a headache. Ready to talk about your system? Give us a call today!